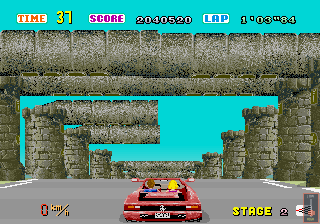 Have you noticed that Gateway's arches are randomly broken in the original OutRun? At times arches don't join, sometimes they float in the air and occasionally complete pillars are missing. It's not very noticeable at high speed, and the precise nature of the breakage isn't consistent. Overall though, it spoils the illusion of what would otherwise be a cool level. For my rewrite, there's a simple solution to this problem; but not for the original game sadly. OutRun's software engine can display 76 scenery sprites at any one time, which are initialized dynamically as the level progresses. 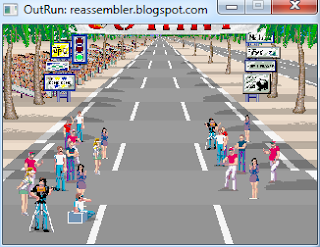 Further sprites are reserved for traffic and other essential objects. Each Gateway arch comprises 4 sprites (two pillars and two joining sections). So we can display 19 complete arches at any one time. Therefore, on complex stretches of road where no free slots can be allocated, some of the pillar components are simply skipped. Thankfully, we don't have memory or speed restrictions on a modern PC and can allocate additional slots to dynamically spawn sprites. In fact, it's as easy as changing a single number. And here's a screenshot to (somewhat) prove it. The illusion when moving through the level is greatly improved, and when I eventually increase the frame rate beyond the original 30fps, this level will be awesome! 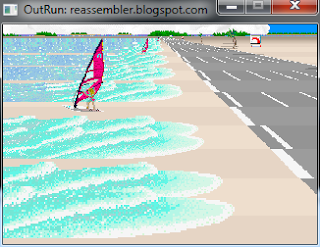 Finally, after years of hard labour, here's a technical demo of the OutRun C++ port. The demo showcases recent work porting the core level rendering engine. The benefit of rewriting the engine, is that it will facilitate modifications and enhancements to the original game that Yu Suzuki only dreamed of. Now, let's get arty and check out some stills from the demo. I've implemented the ability to change the horizon y coordinate, so we can experience viewpoints never seen in the original game. How about a bird's eye view of the start line? We can also straddle left and right, so it's possible to find further interesting camera angles. Although this one reveals that our surf-boarding friend isn't actually in the water! Messing with the original engine can highlight its limitations of course. This demo allows you to scroll further left and right than the original engine, which can cause glitches. And finally a view down the final straight of Coconut Beach before the road fork. 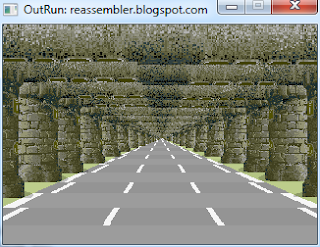 Alas, the road fork code hasn't been ported yet, so this is the road to nowhere at the moment. 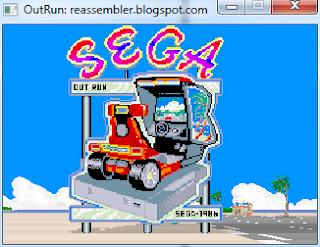 OutRun Revision B ROMs. They must be named correctly and placed in the roms subdirectory. No other set will work. Although you can use the patched set from OutRun Enhanced Edition. I would recommend running the demo from the console to see any error messages. Microsoft Visual C++ runtime libraries. Having control over the rendering engine surfaces glitches and limitations present in the original code. 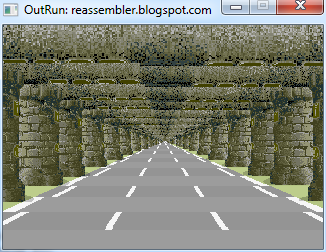 Using unpatched roms, the sprite zoom bug mentioned in this post is evident. You can use patched roms to eliminate this. There is a bug where a random shadow pops into view dependent on the camera x coordinate. This is present in MAME as well, but is hard to reproduce when you're actually racing through the level. I need to get this verified on hardware to help track down a solution and determine whether it's a video emulation issue or a bug in the original codebase. Let me know what you think by leaving a comment below. 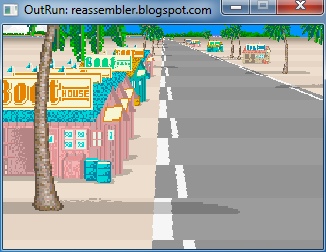 OutRun uses a lookup table to set the horizontal and vertical zoom values of sprites based on their z co-ordinate. Unfortunately, one of the vertical zoom entries in this table is incorrect. If you drive as slowly as possibly by gently tapping the accelerator, there is a single position where sprites snap to an erroneous vertical zoom value. This causes the sprite to clip incorrectly and jolt to a different offset. You can see an example of this behaviour in the animation below. 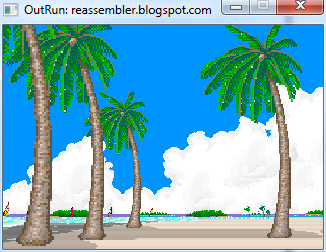 Note the third palm tree from the left suddenly snaps and zooms to an incorrect position. Unbelievably, this applies to all sprites in the game. Although it's only noticeable when driving at low speeds. However, once spotted it's hard to ignore. I've updated OutRun: Enhanced Edition with a patch for the bug. In other news, expect an early tech demo of my C++ port very shortly. It was in coding the port that I spotted this bug. Update: The Sega Saturn port does not suffer from this issue. Looking through the Saturn binary, I can't find the lookup table used by the arcade version, so this area was probably rewritten for hardware purposes. The Xbox port (part of OutRun 2) does have the bug.